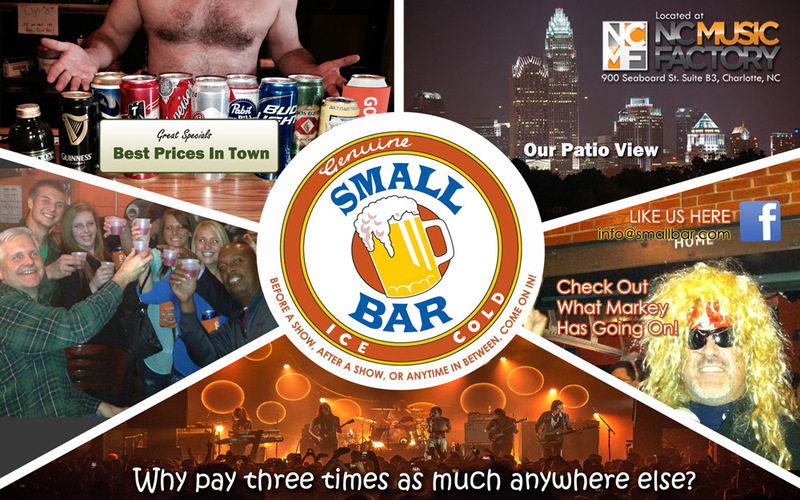 Small Bar is located in Charlotte, NC at the NC Music Factory. SMALL BAR IS LOCATED IN THE CENTER OF THE NC MUSIC FACTORY, WE FEATURE A HUGE PATIO, DRINK SPECIALS THAT WONT BREAK THE BANK, AND AN ATMOSPHERE FILLED WITH GREAT MUSIC, AWESOME BARTENDERS, AND A LAID BACK FEEL. NO EGO HERE! PLUS YOU CAN ORDER FOOD FROM MADDIES DINER AND IT WILL BE DELIVERED TO YOUR SEAT AT SMALL BAR. COME ON!